Sitting at the counter at my favorite Long Beach breakfast place, I got into a conversation with fellow counter diners about good, homemade corned beef hash vs. the canned stuff. Anyway, one new acquaintance, Dr. Hal, told me about a place in North Hollywood, Chiba, that's been his favorite sushi place for many years. A family-run place, he said, the best sushi he's had anywhere. Of course, I felt a smidgen of skepticism when I heard that lofty statement. I didn't really know Dr. Hal's sushi credentials. But from our conversation about corned beef, I got the sense that Dr. Hal, a Jewish guy originally from New York-New Jersey area, knows good food. Plus, I liked what I heard about the family running Chiba for a long time in one of those crowded little strip malls in North Hollywood. So this past Saturday, Dr. Hal, my friend Susan and I ventured up north for a Chiba visit. It was definitely worth the drive. Yes, Chiba is in a pretty ratty-looking strip mall that has a sliver of a parking lot. To me, that's a good thing: a true mom-and-pop original that doesn't rely on awe-inspiring ambience or architectural brilliance to distract diners from the food itself. But the parking situation is so bad that Chiba actually hires a hardy gentleman to provide valet parking. Smart, if a bit surprising to see a valet sign in this shabby strip mall. We walked in and the place was bigger than I expected, with two sushi bars plus a good number of large-party, family-size dining tables. The sushi bar that runs along the wall left of the entry had 3-4 sushi chefs manning it, while chef-owner Shigekazu Chiba held court alone at the squared sushi bar in the center. Dr. Hal had gotten us a reservation at Master Chiba's sushi bar. Sweet. The place was packed, with multi-generational families filling the sushi-bar seats and the tables, enjoying both raw fish and the homestyle dishes prepared in the kitchen. I was impressed with the diversity of customers - varied ethnicities and ages - and all the KIDS, some as young as 4 or 5, enjoying sashimi sliced lovingly for them by Shig. A couple speaking Hebrew and their adorable daughter, about age 5-6, sat next to me at the sushi bar, and I watched with delight how the little girl slurped up a little plate of yellowtail nigiri (trimmed to kid size portions by Shig) and proceeded to chow down her mother's albacore sashimi, too. At the other sushi bar, I spotted two tow-headed kids (probably 8 to 10 years old) enjoying some type of roll with varied sashimi slices on top. Every customer is clearly a regular. And despite the decent size of the restaurant, you'll have a wait if you come after 6 p.m.
Clearly the reason for the popularity is Shig Chiba and his mother, who are both so warm and welcoming and make good food accessible to everyone. Shig grew up at the restaurant - it was his late father's. Shig was born in Japan but came to the U.S. when he was 11, the year his father started the restaurant. 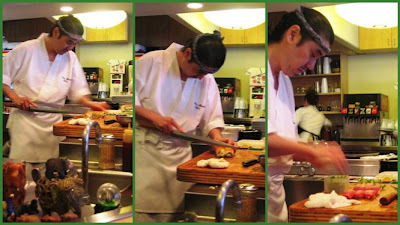 Eventually Shig returned to Japan to train and become a sushi chef. 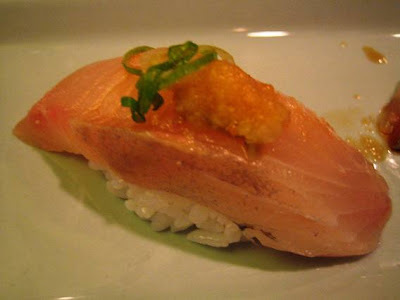 His sushi pedigree clearly proved itself in our omakase meal. The fish was exceptional quality, his flavor touches understated, spot on, sensational. But what makes Shig Chiba an exceptional chef is how he casually and subtly, in a very friendly manner, teaches his clientele about quality food. He raises their standards and expectations by offering the best, no matter what their Japanese food knowledge. He respects each customer - even the little ones, judging by the fine cuts of fish he offered up to the little girl sitting next to me. If she's consuming such high-grade fish at her young age, she will demand nothing less when she gets older. 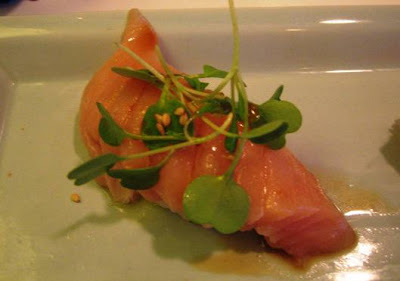 ... albacore belly topped with micro arugula and a dash of ponzu (citrus soy sauce). 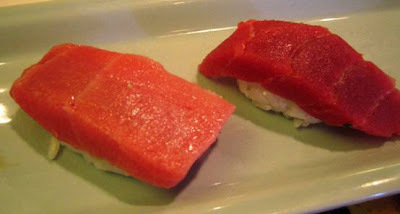 The toro and maguro were perfect. I didn't dip either piece in shoyu so that I could fully enjoy their clean flavors, each enhanced with just a small dab of wasabi inserted by Master Shig. But the albacore belly was the clear champion of this first plate: buttery and mellow, with the arugula an unusual but perfect garnish, adding a nice nutty flavor. Ranks in the Top 3 of the night. The halibut had my FAVORITE shiso leaf tucked inside. 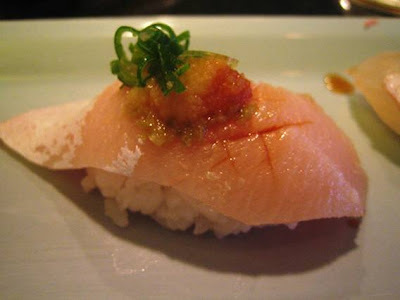 Lovely - a clean fish taste enhanced with the sweet tang of the shiso. 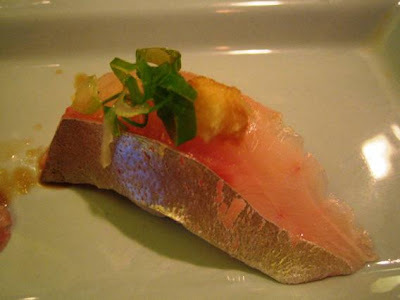 The yellowtail belly was another morsel of buttery goodness, with a dab of yuzu providing a slight kick. YUM. 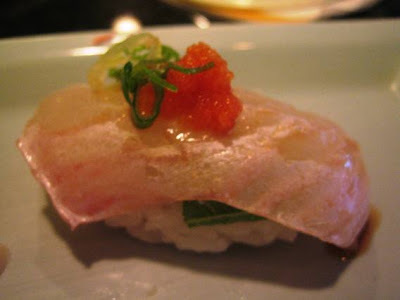 The tai snapper also got a nice kick from some yuzu - but nothing that overwhelmed the smooth goodness of the fish. The shima aji (amberjack) was my favorite of this bunch. It tasted as beautiful as it looks: clean and sophisticated, with a shade more flavor than the earlier courses. Another Top 3 sushi of the night. The kanpachi was like a palate cleanser between the two ajis, but the dab of yuzu brought out the mild flavor to a perfect level. 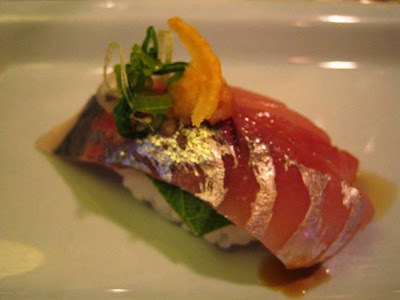 The regular aji (Spanish mackerel) was perfect, especially with that sliver of shiso leaf tucked inside - you could taste the mackerel flavor, but it was so subtle that Susan, who doesn't enjoy stronger flavored fish, remarked on it. 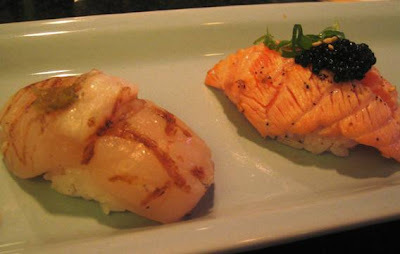 The seared scallop (left) had a smoky flavor enhanced by the dab of yuzu. And the seared salmon was an utter delight, moist and flavorful, topped with caviar. I haven't enjoyed salmon seared this perfectly in a long time - most places sear it too dryness. The salmon is my third choice for Top 3 of the night. 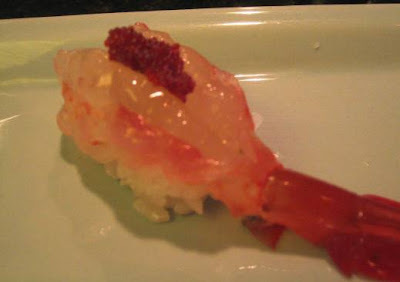 Another sushi favorite of mine is amaebi, and Chiba-san topped it with shrimp roe. Sweet and meaty, almost like lobster. Sigh. 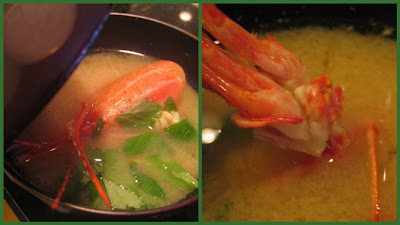 This is REAL miso soup, comforting and flavorful, not just salty. By this time, Susan and I were huffing and puffing. I let Shig know we'd hit our limit. 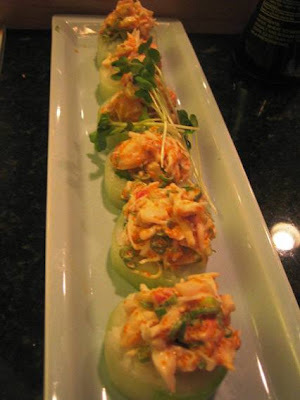 We watched him fashion this creation and definitely wanted a taste: asparagus and avocado roll with a delicate cucumber skin, topped with a lobster and snow crab salad. 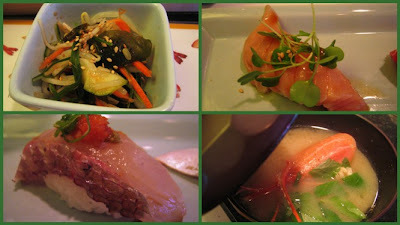 It was yummy, and proof that Master Chiba is as fluent in modern creations as he is in traditional tastes. 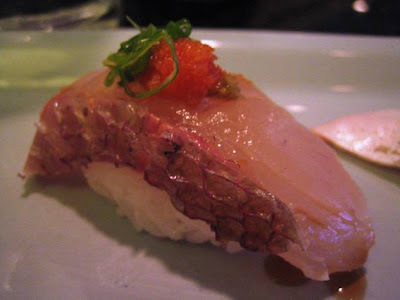 The bill: the omakase sushi cost us about $60 each. Incredible value for the quality we enjoyed.